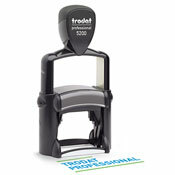 The Trodat Professional Stamp is ergonomically designed to be the ideal product for heavy-duty use. Highest quality standards make the Professional a completely reliable office product. Ergonomic and reliable heavy metal stamp. Up to 6 lines of text. Impression area 1" x 1-5/8"
Ergonomic and reliable heavy metal stamp. Up to 7 lines of text. Impression area 1-1/8" x 2"
Ergonomic and reliable heavy metal stamp. Up to 6 lines of text. Impression area 1" x 2-1/4"
Ergonomic and reliable heavy metal stamp. Up to 8 lines of text. Impression area 1-5/16" x 2-1/4"
Ergonomic and reliable heavy metal stamp. Up to 10 lines of text. Impression area 2" x 2-3/4"